She was beautiful... she was outspoken, she was multi-talented, and widely known on her high school campus, and in the community. As a youth her coaches believed she could have trained and succeeded in the Olympics, but she wanted to use her strength and speed to help people. She wanted to be a firefighter. Karen Lee FitzPatrick, age 18, was the youngest firefighter to perish while battling the blaze of the historic catastrophe, The Thirtymile Fire on 7/10/01. She was known as a great young woman of faith who inspired many in her short lifetime. Now, you can read her poems, her essays, her inspirational wall writings, see images from the fire, and read the handwritten journal notes taken from her fire pack after her death. The center piece poem was written about her when she was first born. It turned out to be prophetic of her life: "Angel Promises." Projected Publication date: June 2007. 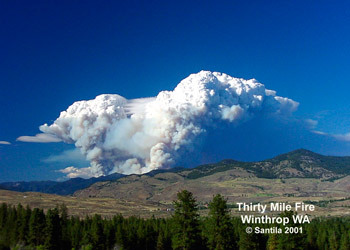 Karen Lee Fitzpatrick was the youngest firefighter killed while battling the tragic blaze of the historic Thirtymile Fire in Winthrop, WA on 7/10/01. Karen Lee FitzPatrick...her bright blue eyes blazed with the love, and power of God. She walked her high school campus and the community with an amazing witness and testimony for the Lord Jesus Christ. 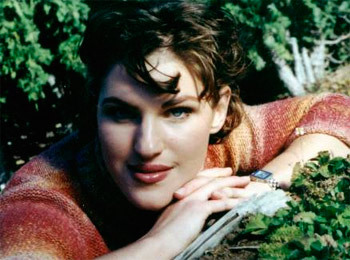 She was a very talented musician, artist, singer and athlete. Although she was a vision of teen beauty and talent, she put Christ first in all ways. Karen was in the National Honor Society, and talked to her high school peers about how knowing Jesus Christ and having a personal relationship with God was the most important accomplishment one could achieve in this life. She surrounded herself in her bedroom with scriptures and wise sayings on her walls, we now refer to as "Karen Street." Her wall writings still inspire people to this day. Early on Tuesday and Thursday mornings before classes began, Karen met with her Christian friends on campus for bible study group, led by Ryan Oletzke, our Pastor's son. The name of the group was J.I.V.E., standing for: Jesus Is Very Important In Everything. Karen used every opportunity to share the love of Jesus in everyday circumstances. She was known as an inspiration, and fountain of life to others. Karen not only influenced her teen peers but had many adult friends as well, on the campus and in the community. In May of 2001, at a formal senior breakfast Karen Lee was given the "Spirit" award by her senior class peers. She was also voted "Most Likely To Be The Next Martha Stewart." If you ever had the chance to experience one of Karen's gourmet meals, or special baked cheesecakes as a gift, you were most fortunate indeed! In grade school years Karen and her team, The Bobcats were molded into a championship team, winning the American Cup in Seattle in 1994. If you ever saw her arrive on the soccer field for the next tournament looking like the Warrior Princess in her mean looking black leather jacket over her uniform, it got infinitely better once the game began, and Karen helped rack up the points for her team often running aggressively toward the ball with a no fear attitude, taking body shots on her upper chest, shoulders and back, much to the amazement of the cheering crowd! Karen was the "first chair" in flute in the West Valley High school marching band, and also played other instruments for the Pep band as well, formerly led the award winning West Valley Panther Band in many parades, as drum major, with white gloves flying, marching in front of a one hundred plus student band...and if you ever heard Karen sing the song, "Hero," at a high school or community event...you would likely remember it forever. For two years, after school Karen worked downtown on "The Ave." at Valerie's Espresso. She kept her bible handy, and when weary souls stopped through that needed an encouraging word, she was ready. In her poem collection that appears in the book about her, "Angel Promises," her poem describing some of her ministry experiences there, "More Than Espresso," is included. "I'll never forget the day she chased down the old ragged bag lady, that cold winter, December day... trying to give her food and presents," a young man name Robert fondly remembers. "She had been waiting for her to come back all week, and had the stuff stashed under the counter at Valerie's." Robert himself had been one picked up off his face, and street life, and turned around with Karen's help and encouraging words. "I'll never forget the first time I saw her on that cold winter, snowy day, as I rode my rickety old bike up to the window to order some coffee. Her bright, shining pink lips matched her bright pink outfit...and her eyes were so bright and alive. She could see that I needed more than just an Americano coffee. We talked for awhile." "Let me share some verses with you!" she said, grabbing her well worn black leather bible. "She read Psalms chapter 40 to me, about being lifted out of the dark pit by the Lord. I was amazed. I had just read this same passage not 30 minutes before as I sat on the floor of my tiny apartment, reading a bible my grandmother had given me. I knew it had to be a God-thing. Karen inspired me to get off the alcohol and drugs, and go back to college, with God's help." That he did. It took awhile, but Robert has come a long way! One of the unusual things Karen wrestled with was an unusual premonition that she would not live far past her teen years. From time to time, she would share this with me and I encouraged her to plan anyway, for such things are certainly in the hands of the Lord. When Karen made a plan to work for the U.S. Forest Service for the Summer, then enroll in the Fire Science program that coming Fall... it was the most planning for the future I had seen her do. Although she was practically a born athlete who, according to track and gym coaches, could have trained for the Olympics if she desired, she wanted to use her strength and speed to help people. She announced to her family in her Senior year... "Mom, I want to be a firefighter." Amid the terror, and chaos, Karen knelt by a little rock in her fire shelter, we call "her Gethsemane," and prayed with the other three firefighter friends she was trapped with, Jessica Johnson, Devin Weaver, and Tom Craven. She was heard praying loudly, and she also prayed for the safety of those on the road who did survive. Karen was an intercessor, and at that moment these young people were facing the point of entry into eternity. Then all was silent. 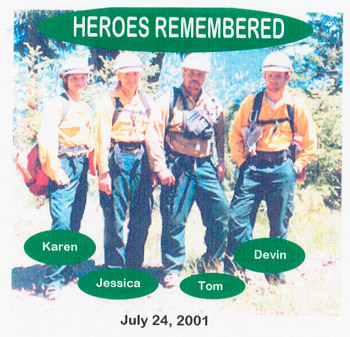 At approximately 5:30 PM, 7/10/01--Karen Lee Fitzpatrick, and her three firefighter comrades, died of smoke inhalation and breathing products of hot combustion, and superheated air. There was an explosion. A firefighter witness who peered up from under his fire shelter in the creek, saw a fire ball roll around the trees of the forest, headed directly for them. It then hit the rocks where they were, like a torpedo. At 6 PM, a huge, pure white cumulous cloud formed high above them ...bearing four linear steps at the top. This amazing photo captured on film by local Winthrop photographer, Sandor Feher, has been come to be known as "The Stair Way To Heaven" picture. Most recently, Karen's Grandmother Ruby called me on the phone, "Kathie look again at the picture. It's a white galloping horse, leaping up over the mountain. The steps mount to the back of the horse!" I looked again. Yes...on the left was the back of the horse, with tail flying, back legs bent. On the right was the front legs, bent. The head of the horse, follows the top cloud line. Amazing...will this story ever cease to be more spectacular? Another Christian friend, an artist and teacher, called me after reviewing the photo, "Kathie I see multiple horses...one is looking straight on." Karen's grandmother, Ruby called my attention to Revelation 19:11-15. In this passage it describes Jesus returning to earth on a white horse, with his saints--the believers, behind him on white horses. Wow...what can I say? God does know what he is doing. We miss Karen Lee deeply, but God chose this as her appointed time for his own eternal reasons and purposes. God also wishes for Karen Lee to continue to speak. Her wall writings, poems and essays are now available in a book to remember her, "Angel Promises," through Pleasant Word/Wine Press Publishing Group, Enumclaw, WA., or available through www.amazon.com. The author is myself, Karen Lee's Mom, Katherin B. FitzPatrick. 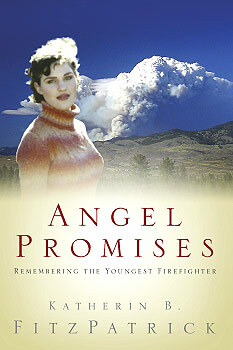 In the meantime, one can read more about Karen Lee at the Fallen Firefighters of America web site: LastAlarm.net. Scroll down to "Warmly Remembered..." and look for Karen L. FitzPatrick.